Because life is constantly changing, your estate planning documents should change alongside it. These periodic updates are necessary in order to ensure that your loved ones are properly provided for after you’re gone. There are very specific circumstances in life in which updating your estate planning documents is strongly suggested; for example, when you get married or divorced. Florida’s Probate Code states when a person marries after making a will and the spouse survives the testator, the surviving spouse will receive a share in the estate equal in value to that which the surviving spouse would have received had the testator died intestate unless the spouse has waived that provision via a prenuptial or postnuptial agreement, the spouse is already provided for in the will, or the will specifically mentions an intention not to make provisions for the spouse. Florida has a post-divorce automatic nullification statute when it comes to former spouses: former spouses, post-divorce, are effectively cut out of each other’s wills. With some exceptions, this also applies to beneficiary designations on life insurance policies, retirement accounts, and payable on death accounts. In other words, the former spouse is treated as though they predeceased the deceased spouse. When family members die or are born, or a beneficiary’s life otherwise changes such that it no longer makes sense to proceed with gifts as is, you should also revisit your estate planning. For example, in some circumstances, it may make more sense to set up asset protection or a special needs trust rather than providing for an outright gift. 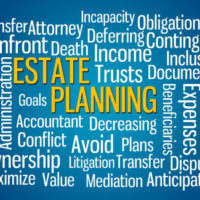 Estate planning updates are also necessary when there have been major changes in the law which could affect the original estate plan; for example, if there have been material changes in estate taxes. Taking the time to update your will is vital to ensuring that your loved ones are taken care of, particularly when it comes to planning for their futures and accounting for your own retirement. For example, some people simply make it a habit to revisit their estate planning every five years, regardless of any new circumstances that might arise. Working with an attorney to do so is simple and helps ensure that everything is done correctly in and comport with the law. Contact one of our experienced estate planning attorneys today to find out how we can help you update your estate planning documents today.